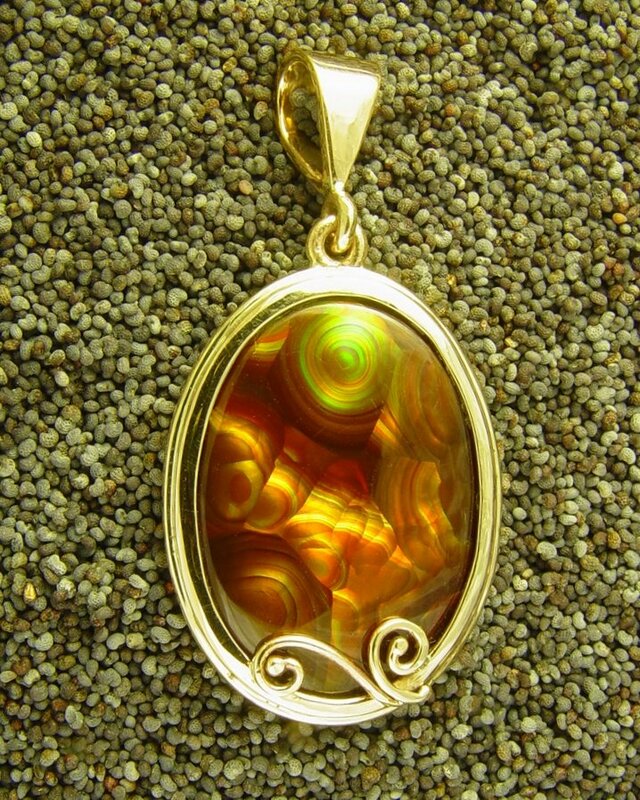 “Fire Agate Pendant,” 14-kt yellow gold pendant set with a cabochon fire agate, by Mark Somma. Licensed under CC By 2.0. Since time immemorial, jewelers have used just about every type of metal they can acquire for their creations. When new alloys and metals emerge, such as titanium and stainless steel, they eagerly embrace them. Jewelers adapt them for jewelry making and create beautiful pieces from them. Fashion trends utilizing trendy metals come and go. However, three jewelry metals have withstood the test of time and continue to have a strong presence in modern jewelry. They are gold, silver, and platinum. These three metals belong to a group of elements known as the noble metals. Chemically, noble metals resist oxidation and corrosion in moist air. They also possess varying degrees of resistance to acids. This group includes the following elements: ruthenium, rhodium, palladium, silver, osmium, iridium, platinum, and gold. These metals occur worldwide, but not in large enough quantities to render them less valuable. They are considered precious metals and have been used as currency (a store of value). Many cultures, historically and currently, consider these metals beautiful, sensuous, and glamorous, which increases their appeal. These metals also possess malleability, which makes them practical choices for jewelry making. For all these reasons, the trio of gold, silver, and platinum continue to enjoy considerable popularity as jewelry metals. “Engagement Ring with Diamonds,” marquise and pear-shaped diamonds in platinum settings, with accompanying gold wedding band, by Lorraine Hughes, Dot The Jewellers. Licensed under CC By 2.0. Although long coveted for its beauty, gold possesses physical properties that have also captivated humanity. Since gold never tarnishes and has great workability, many jewelry designers and makers prefer it to other metals. In fact, a single ounce of gold can be stretched into a thread more than 50 miles long. You can also roll that quantity into a sheet that covers 100 square feet in area. If properly cared for, gold can last indefinitely, which makes it a prized metal to designers as well as consumers. It doesn’t oxidize or corrode, and only a handful of rare acids or hot chlorine bleach can damage it. Recent studies suggest that gold originated in the far reaches of the universe, billions of years ago. It arrived as dust on Earth in its infancy. Gold has witnessed many transformations, and the material made into jewelry may continue to do so. Gold can be reused by melting down old gold objects and reforming the gold into new pieces. For example, old coins and broken pieces of jewelry can be melted down and reused to make new gold jewelry. Despite gold’s desirable properties, it does have one significant drawback: softness. This means it wears out easily. (This quality differs from gemological/mineralogical measurements of hardness as resistance to scratching). However, mixing gold with other metals creates gold alloys that are stronger, more durable, and better suited for jewelry use. While jewelers do use pure gold for some jewelry pieces, these dent and show wear so readily that most people don’t wear pure gold jewelry on a regular basis. Metals commonly alloyed with gold for jewelry purposes include: silver, copper, nickel, iron, zinc, tin, manganese, cadmium, and titanium. In addition to enhancing gold’s strength, alloying changes some of its other properties, too. For example, some gold alloys stain skin or cause allergic reactions. The gold itself doesn’t cause these reactions. Rather, the alloyed metals do. 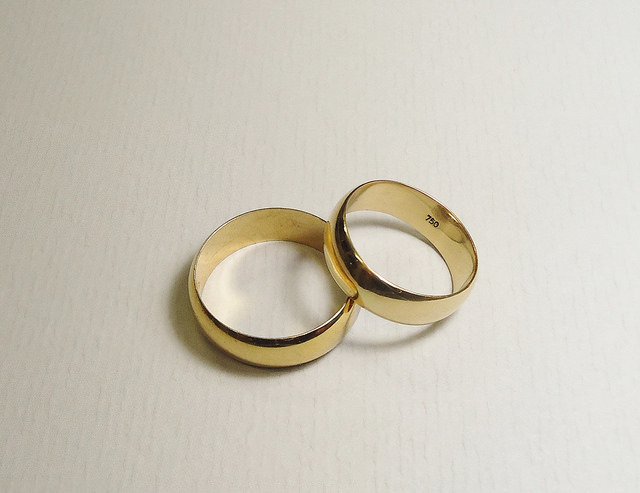 “Wedding Rings,” 18-k gold, by Mauro Cateb. Licensed under CC By 2.0. When discussing gold and its alloys, the term karat indicates the purity of the gold. 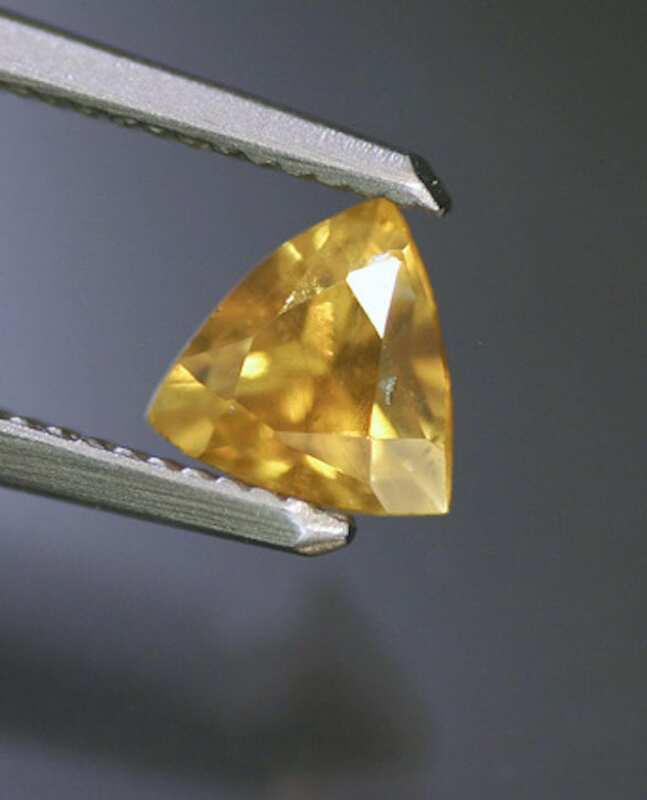 (Don’t confuse karat with carat, which is a unit of measurement used to describe gemstone weight). Pure gold, which contains no other metals, is termed 24-karat gold. So, a 50/50 alloy, half pure gold and half other metal or metals, is 12-karat gold. Alloys used in jewelry making range from 9-karat gold, approximately 37% pure gold, to 24-karat gold. They are required to be stamped and hallmarked according to purity. A newer alloy becoming popular on the jewelry scene consists of 99% gold and 1% titanium. This allows the alloy to retain nearly all its gold color while providing improved durability. The color of gold changes when alloyed. For example, mixing copper with gold creates a darker yellow color. Adding nickel plus zinc, copper, platinum, or manganese produces white gold. 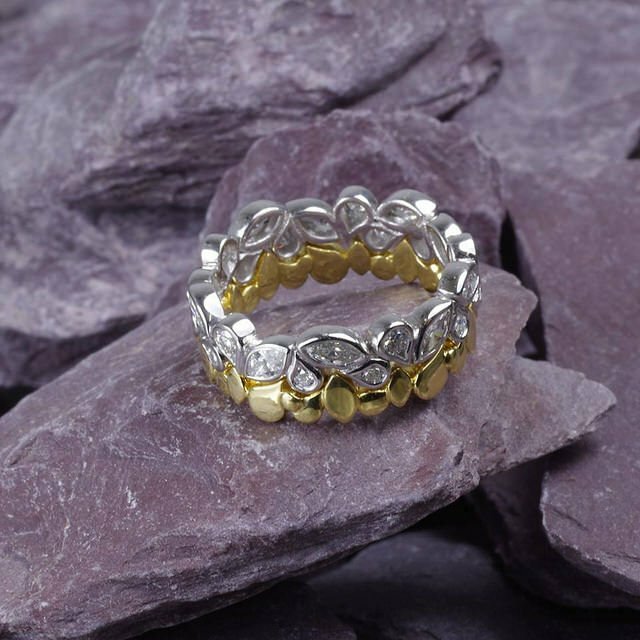 Typically, white gold doesn’t contain silver, which softens gold and gives it a green tint. Other gold alloy colors include green, red, and blue. 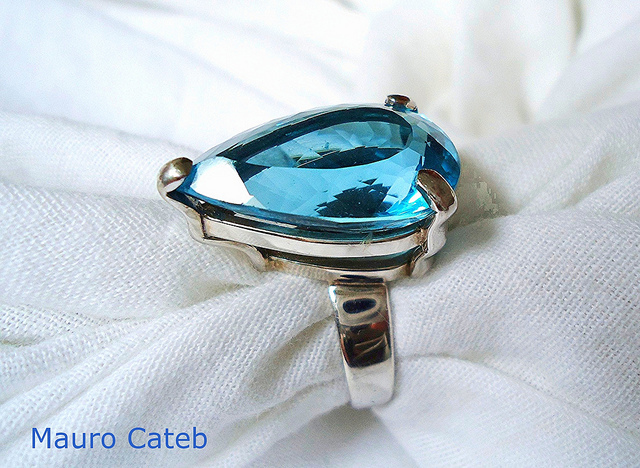 “White Gold and Blue Topaz Ring” by Mauro Cateb. Licensed under CC By 2.0. In the United States, strict laws govern gold purity labeling. To be labeled as a specific karat, a solid item must be within three parts per thousand of the karat marking. Items containing solder must be within seven parts per thousand. Pieces that fail to meet these criteria must receive a lower karat designation. When labeling gold jewelry or other gold items for sale, vendors can’t legally call an item “solid gold” unless it truly is 24-karat. Any other references to an item as gold must designate its karat. The term “new gold” doesn’t mean the gold was recently mined. Rather, it means the gold has been carefully refined to current standards. On the other hand, “old gold” comes from melting down old jewelry, coins, and other gold items. Depending on how much solder the original pieces contained, old gold may have a slightly lower karat weight than the original gold. Impurities in old gold pieces cause a variety of headaches during casting, including bubbles. Therefore, jewelers often send old gold to a refiner instead of melting and recasting a new item at their workshops. Jewelers use gold solder to join gold pieces together. Since solder must have a lower melting point than the pieces it joins, it’s mixed with metals with lower melting points than gold. Gold solder is sold based on color, not gold content. 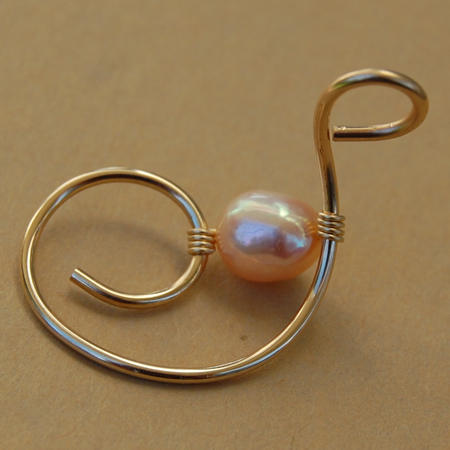 For an attractive look for the finished item, jewelers match the solder color to the joined pieces. This poses no problems for the jewelry’s current owner. However, melting down this piece with its solder in the future will reduce the gold’s karat. 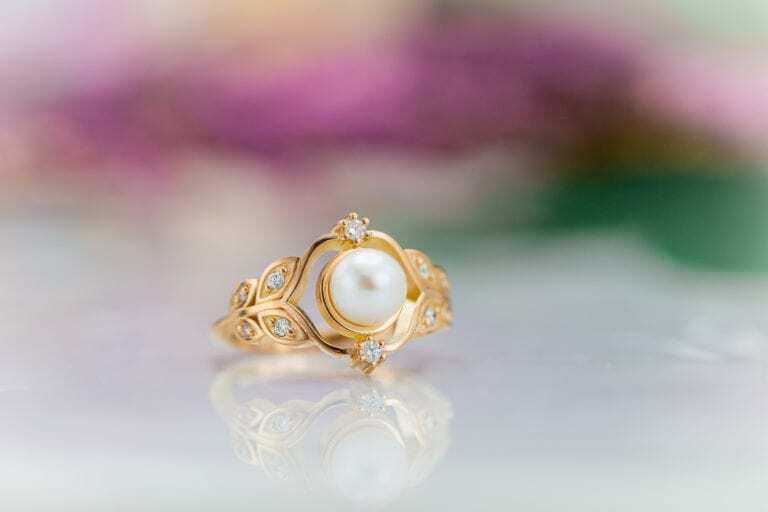 With solid gold selling at a hefty price (as of September 2014, more than $1,250 per ounce), many jewelry makers look for alternative ways to give their customers the look and feel of gold at a lower cost. One common practice, for example, involves coating pieces made from less expensive metals with thin coats of gold. Items made this way are known as gold overlay pieces. There are two distinct overlaying methods: gold filled and rolled gold plate. Gold filled pieces have a minimum of 5% gold applied to the base metal. The relative quantity and karat of the overlaid gold determine their classification. For example, a stamp of “1/20 14K GF” means the piece has a 14-karat gold layer comprising 1/20th of the piece’s weight. While similar to gold filled, rolled gold plate pieces can have gold as thin as 1/40th of the weight. Their stamps also indicate fineness and content, for example, “1/40 14K RGP.” Of the two types of gold overlays, gold platings are thinner and less expensive. With a thickness of a few thousandths of an inch, at best, gold plating wears off easily. Gold overlay pieces have gold layered on top of another metal, so their care differs from that of solid gold. Since the gold layering wears off over time, you can’t use a polishing wheel on these pieces. This could remove the overlay and potentially ruin the item. To learn more about gold content and gold jewelry prices, read this article. “Freeform Gold Filled Pendant” by Leah. Licensed under CC By 2.0. At various times throughout history, people have valued silver more highly than gold. Long used as an exchange medium as well as for jewelry, silver has also found many new uses. Today, these include photography, batteries, auto glass defogger, and magnetic strips, just to name a few. Several factors make silver one of the most popular jewelry metals. 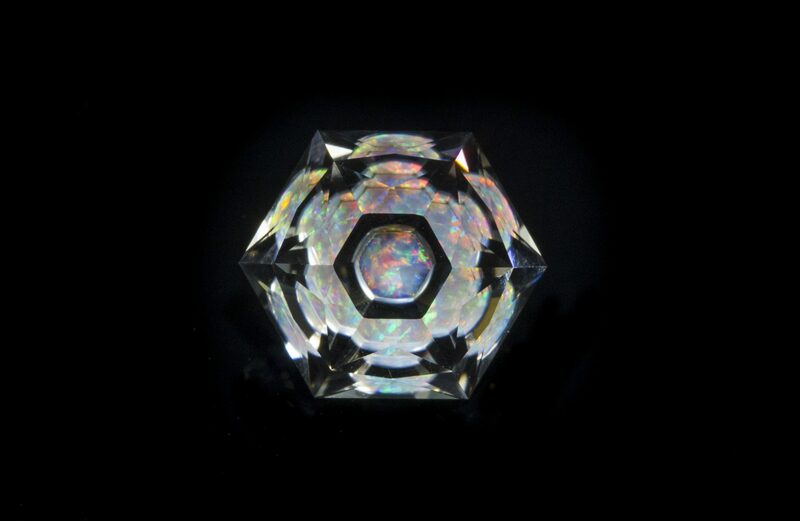 Its luster ranks as its most outstanding visual feature. Silver is also more abundant and much less expensive than gold or platinum. However, because silver conducts heat so well, it’s more difficult to work than gold. For this reason, novice jewelry makers often learn how to solder on silver. Once they gain control of their soldering technique on this highly conductive metal, controlling the heat on gold becomes easier. 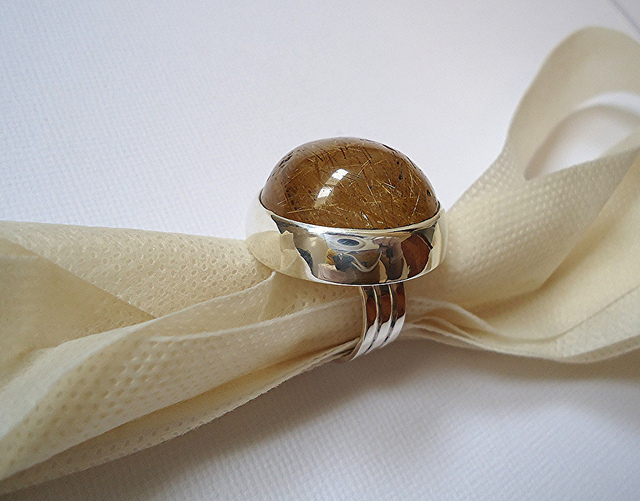 “Silver and Rutilated Quartz Ring” by Mauro Cateb. Licensed under CC By 2.0. This noble metal does have some drawbacks, though. Most notably, silver tarnishes. The term “tarnish” denotes a layer of corrosion that forms over some metals, including silver, when they undergo chemical reactions. The chemical reaction that causes silver to tarnish requires a compound called hydrogen sulfide. Since this compound can occur in our air, silver items left out exposed will tend to tarnish over time. Storing silver items in protective pouches or containers will reduce the amount of tarnish. 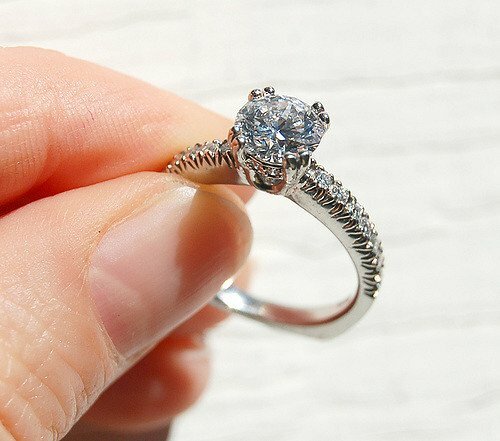 This means you’ll spend less time removing tarnish from your silver jewelry. Yes, silver does requires more care than some other precious jewelry metals. However, you have many polishing options, from commercially available silver polish to do-it-yourself home methods. Don’t let tarnish sour you on silver jewelry. 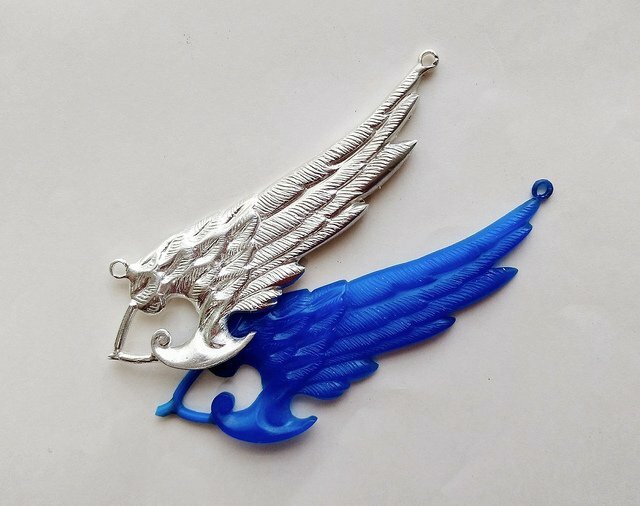 “Winged Pendant 32/40,” cast silver wing with sprues, by Mauro Cateb. Licensed under CC By 2.0. Like gold, pure silver is soft and easily damaged. Therefore, jewelry makers often alloy silver with harder metals to improve its durability. With silver alloys, they can make beautiful, strong pieces suitable for daily wear. The most common silver alloy is sterling silver. Sterling silver consists of 92.5% silver. One or more metals comprise the other 7.5%. Often, copper makes up a substantial portion of that 7.5%, because it increases the alloy’s hardness. The term “Mexican silver” refers to silver used as currency in Mexico, typically comprised of 95% silver and 5% copper. This alloy sees more use as currency than in jewelry. Even silver jewelry made in Mexico is more commonly crafted from sterling silver. In the United States, coin silver contains 90% silver and 10% copper. You don’t usually see coin silver used in jewelry. 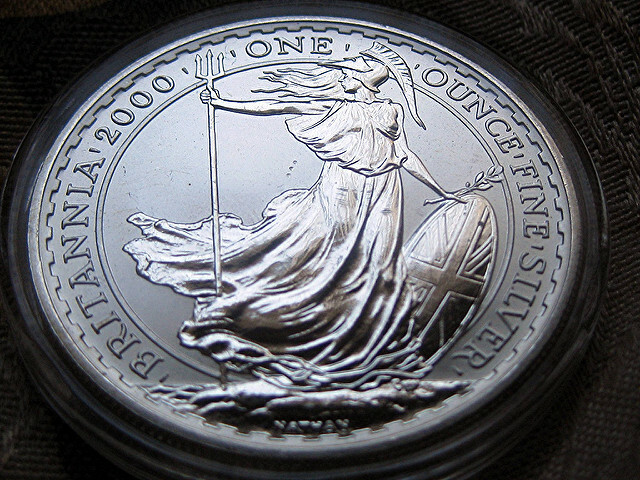 Britannia silver contains a minimum of 95.84% silver, making it a more valuable alloy than sterling. This alloy does, rarely, see some jewelry use. “Britannia Silver” by Eric Golub. Licensed under CC By 2.0. You’ll find a variety of silver alloys used worldwide. For example, a South American alloy, made of 80% silver, doesn’t tarnish. Jewelry makers stamp silver pieces with a code for the alloy used. For example, 925 indicates sterling silver; 958 indicates Britannia silver, etc. When shopping for silver jewelry, inspect the piece carefully for this code. To learn more about silver markings, definitions, and terminology, read this article. Although jewelers use sterling silver more than any other alloy for silver jewelry, other silver jewelry metals deserve a mention. This naturally occurring silver and gold alloy enjoyed great popularity in Ancient Egypt. Due to its natural origins, the ratio of silver to gold varies with each piece. 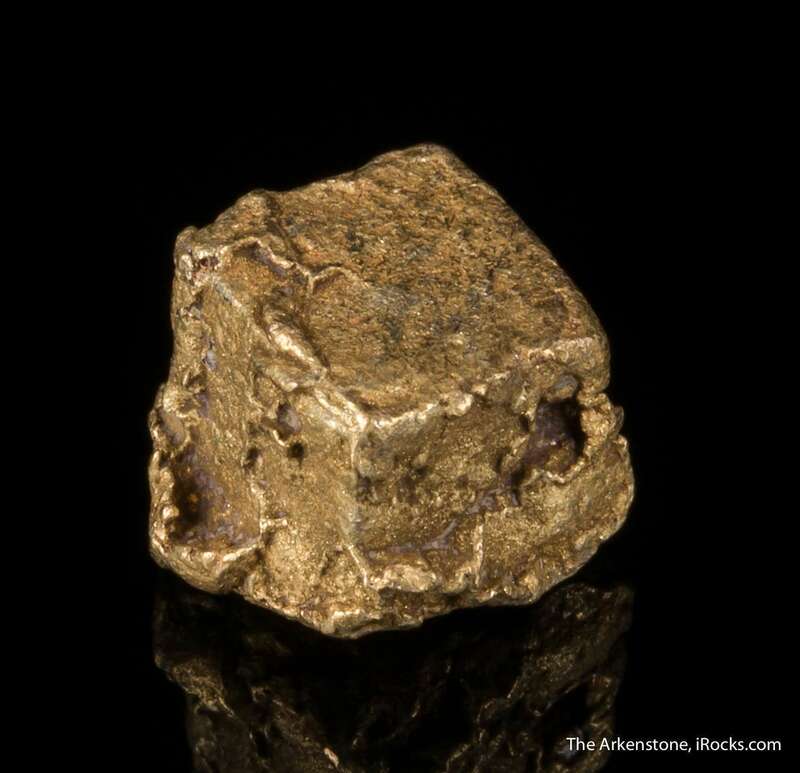 Gold crystalizes in the isometric system and can appear as cubes, like this rare electrum crystal. A natural alloy, this specimen consists of 70% gold, 27% silver and 3% copper. “Gold Var. Electrum,” 0.7 x 0.6 x 0.6 cm, Berezovsky Mine, Middle Ural Mtns, Ekaterinburg Oblast, near Ekateringburg, Russia. © Rob Lavinsky, www.iRocks.com. Used with permission. You’ll typically see this black mixture of silver, copper, and lead used like an enamel. It can also be used as an inlay on etched or engraved metal. Like electrum, the Ancient Egyptians frequently used this material. Over time, niello techniques spread throughout Europe and Asia. While all the silver alloys previously discussed contain at least some silver, some metal names can mislead you. The alloys known as nickel silver or German silver, for example, contain nickel, zinc, and other metals. Although they look like silver, hence the name, they don’t actually contain any silver. “Quicksilver” is an ancient term for the metal mercury. While mercury may resemble liquid silver or “living silver” (hence the name), it doesn’t contain silver. Quicksilver/mercury has no use as a jewelry metal due to its toxicity and its liquid state at normal temperatures. Rarer and more expensive than gold, platinum has unsurpassed holding power and durability. It doesn’t tarnish. 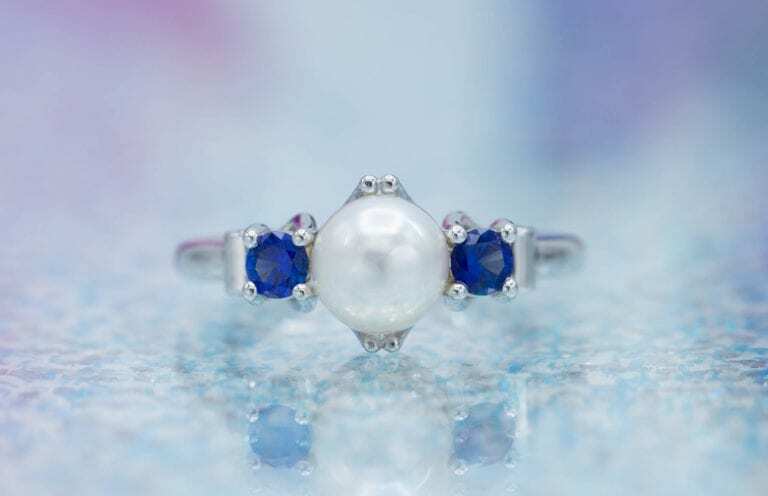 These qualities make it one of the most highly coveted, premium jewelry metals, especially for engagement and wedding rings. Platinum also has a variety of industrial applications, such as in catalytic converters. 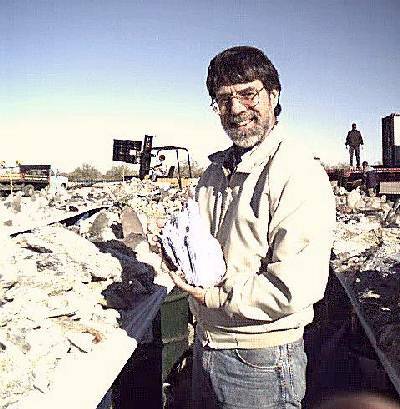 In fact, half of the platinum mined in the U.S. and a quarter worldwide is used for this purpose. The U.S. Bureau of Standards also uses platinum for weights. Since this metal never oxidizes, these weights remain the same forever. “More Shiney,” diamond ring with Diana classic platinum semi-mount, by ilovebutter. Licensed under CC By 2.0. Although platinum use in various objects goes back as far as 700 BCE, its use in jewelry is relatively modern. Since it has an extremely high melting point and resists corrosion so effectively, refining the metal proved difficult for centuries. The oldest recorded use of platinum is as an inlay in Ancient Egypt. (However, the Egyptians thought this metal was a variety of electrum). Native Americans used platinum in small decorative objects for centuries. Platinum remained unknown to Europeans until the Spanish encountered it in the New World. 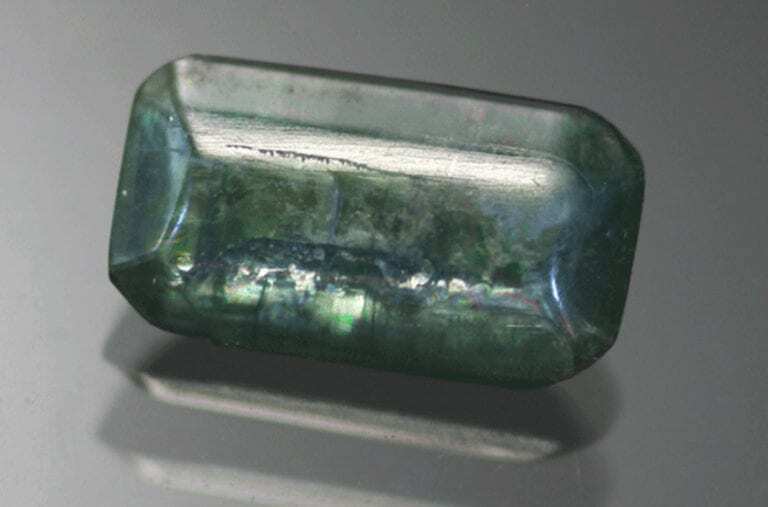 The Spanish called it platina, meaning “little silver.” In accordance with the theories of the time about metal origins, they believed this was “unripe gold” and, therefore, unusable. In the 18th century, researchers identified platinum as a new metal. Henrik Scheffer, a Swedish chemist, discovered how to melt platinum with arsenic. Once refining became possible, artisans used platinum to decorate porcelain while scientists made laboratory equipment from it. However, refining platinum with arsenic proved extremely dangerous. Thus, platinum didn’t gain much popularity until the invention of the oxyhydrogen torch in the mid-1800s. New discoveries of platinum ore in the 19th century brought the metal to the attention of jewelry makers. It became a symbol of wealth and status for early 20th century celebrities. Stars like Greta Garbo frequently appeared on film with platinum jewelry and accessories. 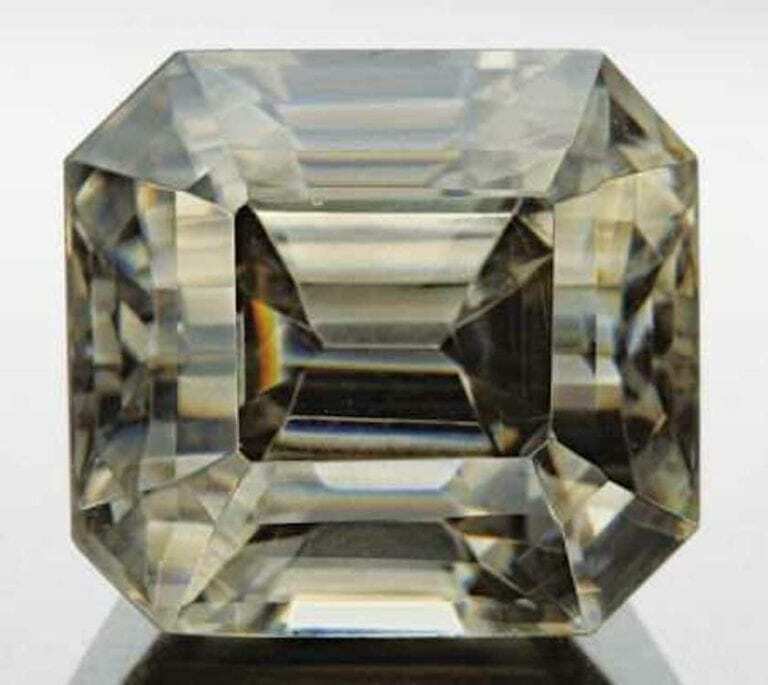 The 530-carat “Star of Africa” diamond has a platinum setting in the British royal scepter. The term “platinum” actually refers to a group of metals. In addition to platinum, this group includes iridium, osmium, palladium, rhodium, and ruthenium. While platinum is the most abundant, all these metals, except osmium, have jewelry applications. Rhodium frequently sees use as a non-tarnishing plating for white gold, silver, and other platinum group jewelry metals. Palladium and iridium are commonly alloyed with other metals or used alone to make jewelry pieces. The most common platinum alloys include 90% platinum and 10% iridium, or 95% platinum and 5% ruthenium. Ruthenium makes for a harder and stronger alloy. Alloy: Mixing two or more metallic elements, especially to give greater strength or resistance to corrosion. Cementation: To surround a metal with a substance that will react with the metal under heat. Silver parts from gold by cementation with salt. Cupellation: A means of separating gold and silver from other metals and impurities. Heating ore in a cupel, a ceramic cup, absorbs the impurities. Distillation: Vaporizing metals with low boing points, like mercury, to separate them from other metals. Water Concentration: Washing ore, which causes the heavier metals to stay behind where they can be recovered. 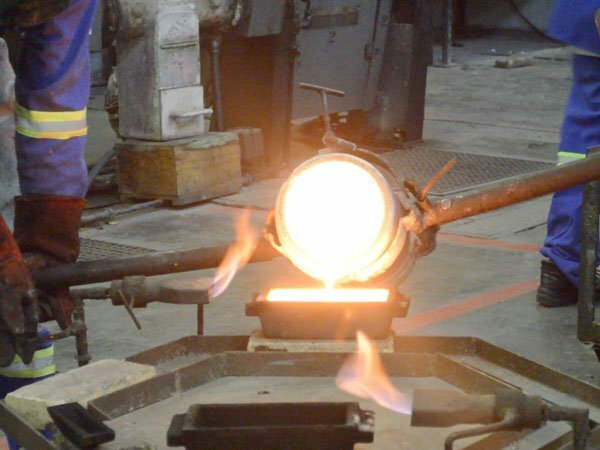 Smelted and purified gold being poured at Fidelity Printers and Refinery at Harare Zimbabwe. “Pouring Gold @ Fidelity Printers and Refinery.” Public domain.